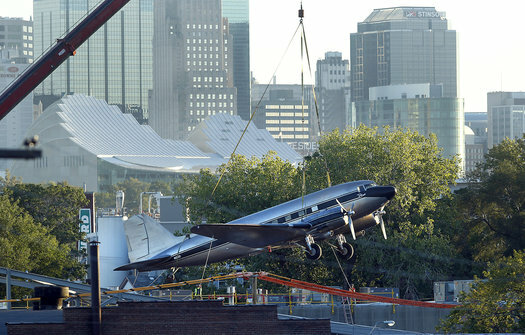 A 1943 DC-3 airplane came in for a smooth and permanent landing just after sunrise Tuesday on Kansas City’s West Side. The symbol for the Roasterie, a Kansas City coffee roaster, now sits atop its headquarters at 1204 W. 27th St., thanks to an engineering feat that took a crew of about 30 and perfect weather conditions to pull off. One of the largest cranes in the Kansas City area lifted the craft from the Roasterie’s back lot onto a steel frame. Even without its engines, the plane weighs a whopping 10,000 pounds. Still, that was light enough that even a 5-mph breeze could have made it too unstable to lift into place. The DC-3, which has been part of the Roasterie’s logo since the company was founded in 1993, is symbolic of its “air-roasted coffee and adventuresome spirit,” said Danny O’Neill, founder of the Roasterie.